Enhance your special day with your very own wedding firework show! 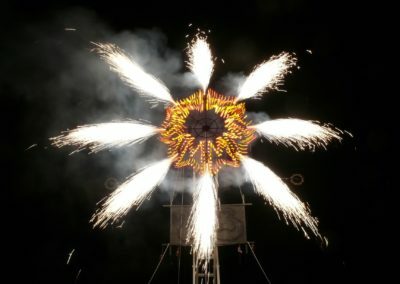 Because most weddings take place during daylight hours, the fireworks tend to work best after the speeches at the reception venue for summer, or before the reception dinner for winter events. As shown in some our gallery photos, fireworks look magnificent against the darkening dusk sky. So you don’t need to plan the show time around total darkness, about 30 minutes after sunset works well. If you’re having a daylight ceremony, perhaps consider some confetti or streamers to add a little extra excitement. It’s best to contact us early in your planning process, as not all wedding venues will be suitable for fireworks. But if your venue works, we have technicians available in all the main centres – Auckland, Wellington, Christchurch and Dunedin, and in many of the regions. And remember, all of Firework Professionals’ displays are tailor-made to suit your location and budget. We take care of all the logistics, leaving you and your audience to just sit back and enjoy the show. If you’d like a firework display to boost your next event, talk to us today.